The importance of the Treaty of Waitangi to Maori is reflected in their strong interest in meeting with the person of the Crown; their Treaty partner. This was reflected in the sending of various Maori delegations to London to seek an audience with the monarch, but in the early twentieth century there were two opportunities for Maori to welcome royal visitors to their own country. In 1901 the Duke and Duchess of Cornwall (the Duke being the second son of Edward VII) toured New Zealand. The focus for Maori was on the royal visit to Rotorua, with thousands from iwi all over the country (except Tainui Kingitanga) organising a Maori welcome and cultural display. Next was a post-war tour by the Prince of Wales (Prince Edward, son of George V) in 1920. The Rotorua leg of the tour was again the focus for Maori, featuring a warm welcome from thousands of Maori, followed by an enormous Maori pageant. ‘The Reception at Rotorua. Enthusiastic Native Welcome. A Memorable Scene’, New Zealand Herald, 14 June 1901. Opposite the [Rotorua] railway station [5,000 of] the local tribes lined the road, and when their Highnesses emerged from the station gave vent to a song of welcome, the unrestrained vigour of which must have rather surprised the Royal visitors. Accompanying the chant with wild gesticulations of welcome and flourishing their taiahas, meres, and battle axes, they raised a deafening song which left no possible room for doubt of the intensity of their feelings. ...A guard of honour of about 100 of the most influential chiefs of the assembled tribes, in full Maori costume, and carrying their taiahas, which accompanied the procession, made a very imposing spectacle, and from their dignified bearing they seemed to be fully aware of the great event they had gathered to celebrate – the welcoming of the grandson of the great white Queen Wikitoria, the fame of whose mana had always been a favourite theme. New Zealand Herald, 14 June 1901. ‘The Maori Reception. A Memorable Scene. Many Tribes Participate. War and Peace Dances. Ancient Native Ritual’, New Zealand Herald, 30 April 1920. The tribes were drawn up in mass formation opposite the grandstand, and it was obvious at the first glance they were keyed up for the occasion. They stood forth in all the finery reserved for such occasions... 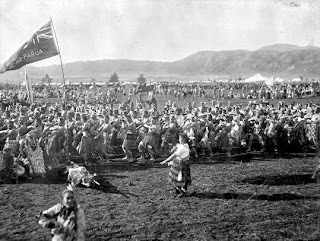 Through two lines of wahine in full poi costumes, chanting a song of welcome, [the Prince] came forward at the slow pace essential to Maori etiquette, and swung round to the stand. As they sighted him tribe after tribe took up the shout of welcome... and it was through this swelling chorus that the Prince made his way to the Royal stand. ...A Maori maiden wearing two feather mats came forward, removed one of the mats, and handed it to the Prince. With the assistance of Dr [Maui] Pomare he placed it round his shoulders and there it remained for the whole ceremony. Prince of Wales (Edward, Duke of Windsor), Rotorua and Auckland, to Freda Dudley Ward [the Prince’s mistress], 27 April to 2 May 1920. MS-Papers-8780-1-3. ATL. 28th April... Today’s stunts, altho’ terribly boring & irritating, would anyway have been a little interesting if it had’nt[sic] poured in sheets till 3.00 PM. The big Maori stunt which was to have been this afternoon has been postponed till tomorrow morning, tho’ I was standing for 4 hours from 9.00 AM onwards. I had to go thro’ long & tedious Maori ceremonies at both the native villages and had to submit to being made to look the most hopeless RF [ruddy fool? ], dolled up in mats & other things while inane Maoris danced & made weird noises at me!! Some of the Maori women sang & danced quite nicely, tho’ they spoilt their stunt by revolting my by kissing my hand when I shook hands with them all & 2 of the ladies infuriated me by trying to kiss me. That was too much sweetheart (not “too bad”) & was the last straw & then my boredom changed into bloody mindedness, particularly when they made me stand for a whole hour by a hot geiser[sic] [Pohutu] to watch it blow off & it never did!! ... 29th April ... I’ve had such a terrible day of Moaries[sic] & all their comic stunts... a reception which lasted 3 hours, throughout the whole of which I had to wear a Moari mat over my shoulders, tho’ it did’nt[sic] make me feel a bit like a Moari! All I was thankful for was that YOU did’nt see me looking such a – fool, beloved, tho’ they gave me some fine presents when all the ‘hakas’ & ‘poi dances’ were over!! (Note: This is material that was culled from the final version of The Treaty of Waitangi Companion: Maori and Pakeha from Tasman to Today, published by Auckland University Press in 2010. Thanks to Bruce Stirling, who prepared this section. For more on the royal tours of 1901 and 1920 see the book I co-authored with David Armstrong: The Beating Heart: A Political and Socio-Economic History of Te Arawa, Huia Publishers 2008).